New stamp set called Take a Spin. I used Pretty in Pink cardstock(100459) for the base of this card. Layered Certainly Celery(105125), Chocolate Chip(102128), and stamped the image on Whisper White(100730) with Chocolate Chip ink. I used the Perfect Polka Dots embossing folder(117335) to that awesome texture on the card! Love how you made the spinner card so pretty!!! #271 following from Stampin Connection. I'm following you from Stampin'connection. I'm #188 on the list as www.bzstampr.blogspot.com. Super cute card! I just got this set and have yet to play with it! I cant wait to get this set! I love it!! I also love your picture frames they are darling. i am now following from sc #296 hugz n blessings. Hi dear, what a super cute card you made. Love your blog. I am looking forward to more of your creations. Thanks for sharing them with so many of us! Very pretty! Am now following along from SC! Great job with the spinner card. 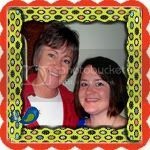 I'm a new follower from Stampin' Connection (#247 on list). Hope you get a chance to visit my blog. Very cute card, perfect for any princess. Now a follower from SU. Awesome card. Those spinners look fun! Great card! I'm now following from Stampin' Connection! Great cards - very pretty! I am now following from SC. Very nice. Following through SC. TFS and God Bless. love it! cant wait to get this set! great job. Hugz n blessings. Love the PINK!!! Cute card. TFS! Love your Blog!! You have some great projects posted. I can't wait to see more. Thanks for leaving such a sweet comment on my blog. I am sorry I didn't reply sooner.